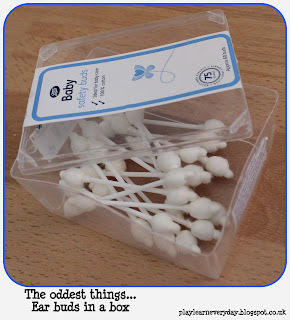 It was a strange day, Ethan pulled the box of ear buds out of his drawer and in my trying to put them away the box popped open and they fell everywhere. He was so excited, he started playing with them straight away, so I decided to let him, and see what fun we could have with ear buds. We took the ear buds out of the box and put them back in one by one. He liked taking the lid off and trying to put it back on. His fine motor control is very good, but he can always use the practice using his pincer grip and improving his Physical Development. I also counted out the ear buds as we put them in the box, and stacked the ear buds in sets of different numbers, beginning to get him accustomed to hearing numerical language and introduce him to Problem Solving, Reasoning and Numeracy.